The all-new Bavaria 40 is unashamedly a cruising yacht and as such, it is equipped with all the necessary gear (and options) that a couple would need for a holiday on the water. 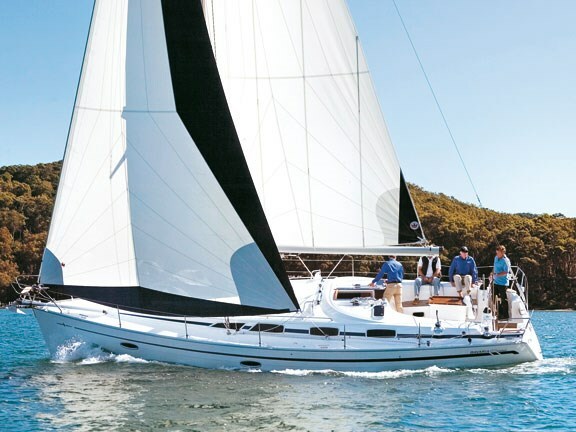 Apart from a brief foray into the racing world with its Match Series of yachts, Bavaria has always had a good range of cruisers and with its new range it has the bases covered with yachts ranging from 31ft right up to the flagship, the Bavaria 50. In between, it has a 34, 38, this 40, a 42 and a 46. However, the biggest departure from its previous boats is the 40. The 40 supercedes the old 39 and although the interior layout is similar, the exterior and the hull shape are quite different. Having spent many inshore and offshore miles aboard an earlier-model Bavaria 40, both racing and cruising, I can attest to the fact that this is a different direction for the German yachtbuilder. First thing to notice is that this is a twin-wheel boat. To accommodate this, Bavaria has brought more beam aft to give a much wider transom and with that, a wider cockpit. It has then given the boat much more bluff transom which pushes the end of the cockpit farther aft. The overall effect is a cockpit almost the same size as their previous 46-footer — I kid you not. In the marina before our test, we had a 46 parked right next door and I could measure the cockpit sizes — they were nearly identical from the end of the cockpit to the dodger coaming. This has all been achieved with little or no space given up to the interior. With the more upright transom, access is now gained through an electrically operated transom door that drops down to form a boarding platform with in-built swim ladder. As an option, this comes with a remote-control that acts like the central-locking fob on your car. Simply push the button and down comes the transom door. Similarly when you leave the boat, press the button and up she goes. Great for security and for ease of access and departure. In the cockpit, Bavaria has kept the central folding table with room on the aft end for your wind gauges, autopilot and plotter which, incidentally, is on a swivel so it can aim at either wheel depending on where the skipper is standing or sitting. Behind the wheels, the helmsman can reach the mainsheet is on a German sheeting system leading aft from the cabin-top traveller. This can be re-routed if preferred and the headsail sheets can be run aft as Bavaria has gone from having four winches to six — a good move given that they are now also offering a genneker system with a prodder as an option. One thing I did note at the helm was that, due to the helms being so far aft, the split backstay system can get in the way a bit. After a while, though, I found myself leaning on the backstay, so it can be either a hindrance or a help. The coaming seats are another good place to helm from especially if you like to steer to leeward. All controls for the 40hp Volvo diesel are on the starboard side, low on the coaming. This I find preferable to how some Bavaria models had them on the coaming top where I thought they may be prone to damage from errant sheets. Moving forward, we find wide decks and provision for the broad folding dodger which wasn’t fitted yet to the test boat. This should provide ample shelter from the elements for the crew as well as some stowage for gear in inclement weather. It would be opportune to mention the big cockpit lockers under the seats which could easily stow a roll-up rubber duckie and a small outboard as well as all the necessary fenders, ropes and buckets etc, that tend to find their way therein. 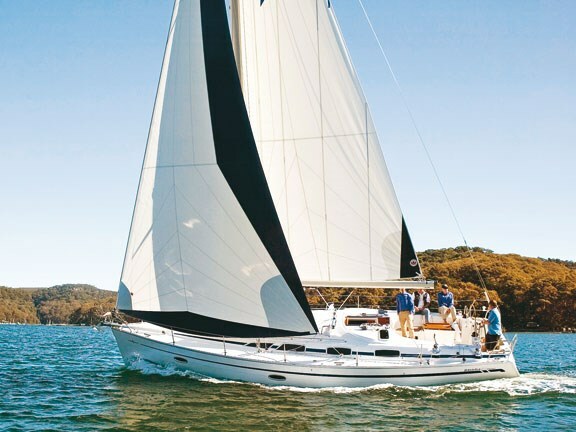 The Bavaria 40 is fitted with a double-spreader Selden aluminium mast with optional in-mast furling. Our test boat had this option with an Elvstrom Sobstad mainsail with vertical battens. It’s a simple system, which uses the outhaul to deploy the main with marks just aft of the first three battens to indicate the first, second, and third reefs. The standard rig is for a conventional, fully battened main, with lazy jacks and a boom bag. A solid boom vang comes as part of the standard package. The genoa is also a Sobstad and resides on a Furlex roller-furler. As mentioned, an optional genneker system is available with an adjustable prodder and all rigging. Unfortunately, the sail had not arrived yet for our test but we got to see how the system works and it would be ideal for family cruising as it’s so simple to use. Of course, all the lines lead back to the cockpit like most modern cruising boats, adding to the simplicity of sailing. 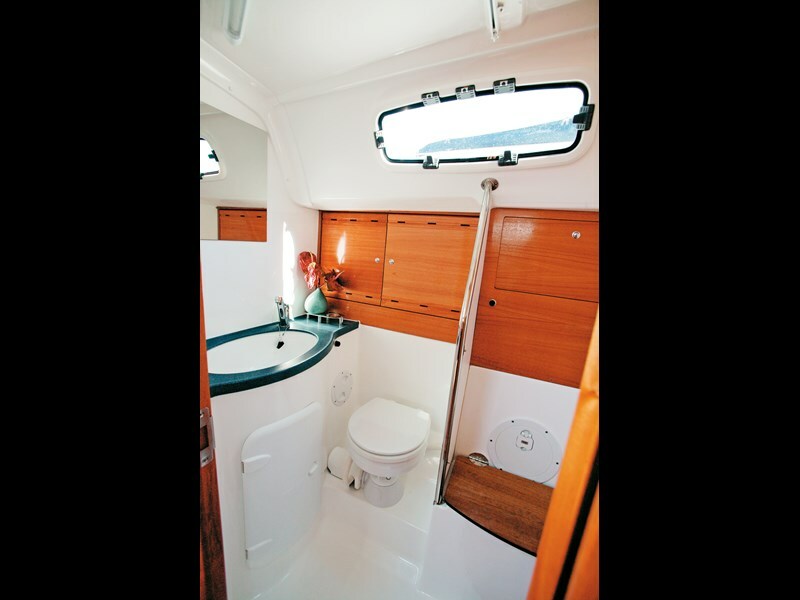 Stepping down the companionway, through the neat, teak swinging doors, one finds an interior in the traditional Bavaria fashion, lots of mahogany trim and a warm, comfortable feel. But look further and one can see the changes Bavaria’s made to this boat. A total of 13 opening hatches and ports for one thing – ventilation will not be a problem. Three opening hatches in the saloon and all the windows along the cabin open, to provide good cross-flow. The layout is a typical three-cabin, two-head setup, with the main cabin in the forepeak. This is a roomy cabin with a big step-up double berth and plenty of hanging and storage space for your gear. The en suite is roomy with hot/cold shower and a pump-out loo (a holding tank is standard). There’s good ventilation but no extraction fan, which would be a good inclusion. 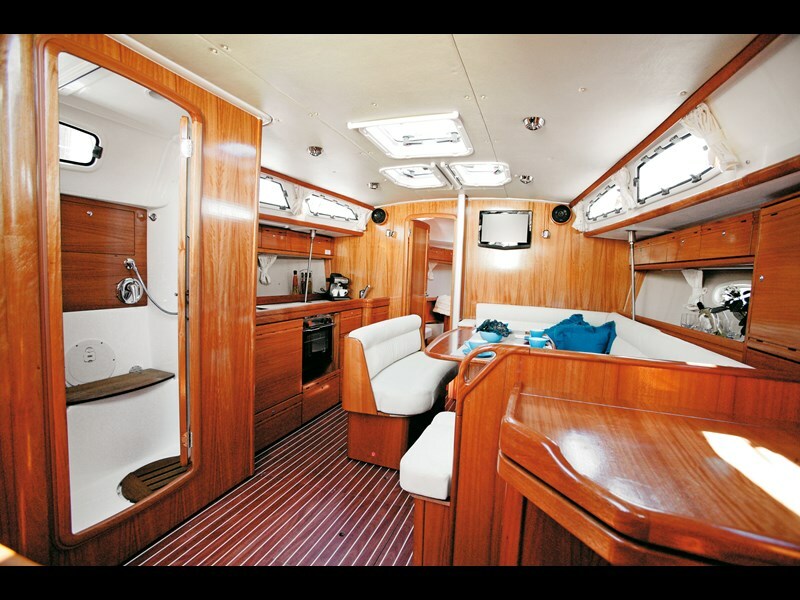 Moving aft into the saloon, there’s a big settee around a mahogany dining table and a separate two-seater lounge so you can sit six in comfort for dinner. 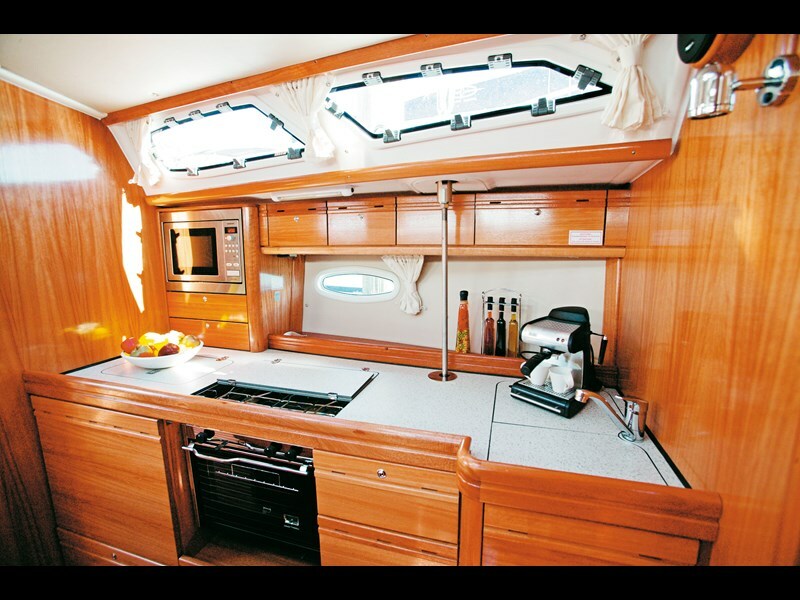 The galley runs along the port side and has a double sink, gimballed two-burner gas stove with oven and ample storage for all your galley equipment and food. The fridge is top-opening but looked a bit small for a boat this size. Perhaps the inclusion of a separate freezer would be a bonus for those longer passages or for when you’re on board for more than a few days. A big bonus on the 40 is the inclusion of a large microwave as standard. It’s a built-in job that sits nicely at eye height and on the test boat it was powered by the optional Mastervolt inverter and battery charger — another great inclusion if you’re away from shore power. Farther aft, to starboard, is the nav station which has plenty of room for plotters and other instruments. Under the table is stowage for charts and there’s more stowage under the seat. The day head is to port and this is a bigger affair than the en suite with a separate shower stall and an electric loo, again with holding tank, as well as a vanity. Under the companionway stairs lies the Volvo 40hp diesel, which is accessed by lifting the stairs on their gas struts. There are also side hatches in the aft cabins for all-round access to the engine. We set out from North South Yachting’s headquarters on Sydney’s Pittwater on a sensational autumn day with a light sou’easter. The engine fired up with hardly a rumble and we motored out effortlessly. A three-blade, folding prop is standard and this pushes the 40 along to around eight knots. 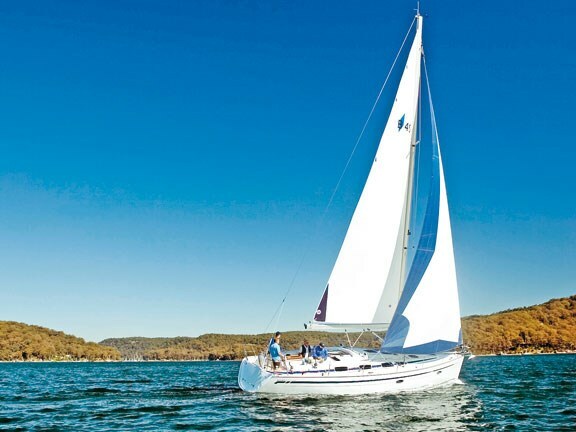 A comfortable and economical cruise of around six knots can be achieved at around 2000rpm. As our test boat was fitted with the Selden in-mast main furling system, getting the main set is no more difficult than pulling out the outhaul. Then it was simply a matter of pulling out the jib. Under sail, the Bavaria 40 felt comfortable in the little wind squirts we were getting (up to about 15kts). 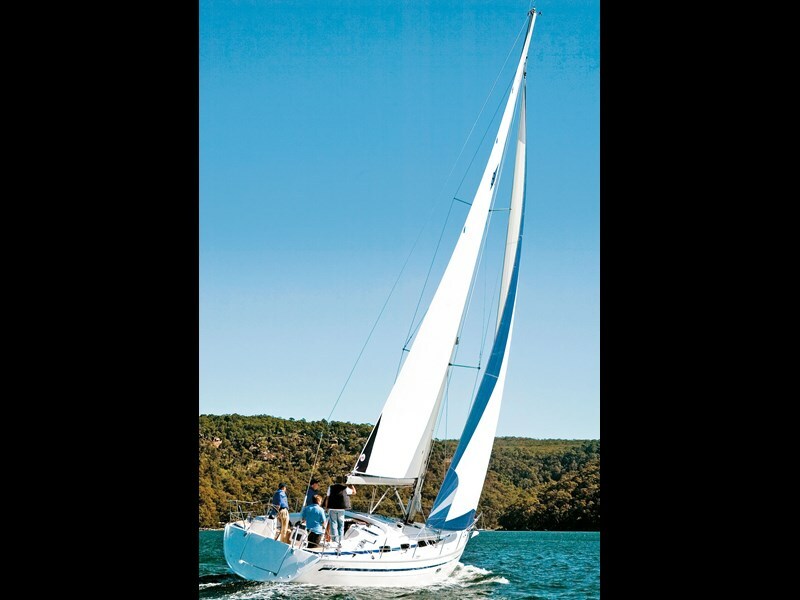 This is no doubt due to the optional lead keel, which adds a bit to the ballast and stiffens the boat. It’s an option that’ll set you back around $20k, but worth it if you’re planning any blue-water excursions. Pointing is probably not this boat’s forte but, that said, it’s no slug and it was in out-of-box trim. We found it happy at about 45 to 50 degrees to the wind. If you wanted to race, you might want to look at some high-tech sails. Upwind we were getting a good six to 6.5kts of boatspeed in around 10kts of breeze. Off the wind, we zoomed along at eight with 12kts of breeze. Simplicity is the name of the game with the 40 and with the main close at hand to the helmsman, it’s a snap for two people to sail it. 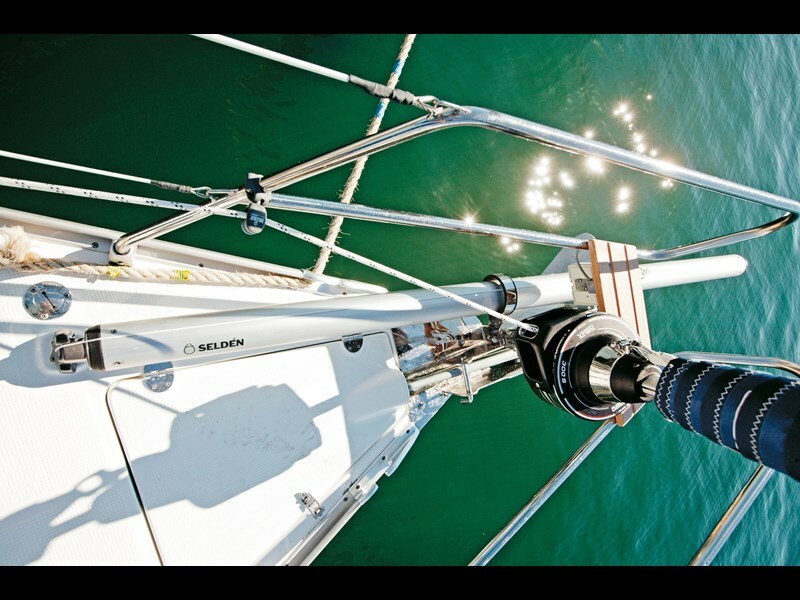 Getting everything back in order after a sail is no more difficult than pulling the jib back on its furler and similarly hauling the main back into the mast. If you were on a twilight race, you’d certainly be first into the bar with no folding of headsails or flaking of mains. It’s a very manoeuvrable boat both in forward and reverse so getting in and out of your pen won’t pose a problem. The deep rudder offers plenty of bite. 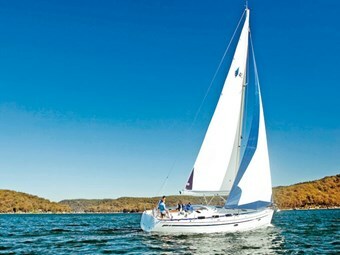 Overall, I liked the new Bavaria 40. I liked its roominess — both inside and on deck. I loved its easy motion through the water and the simplicity with which it can be handled by two. It’s a boat that will appeal to husband-and-wife team who want to cruise and, well, experience the Bavaria lifestyle. And with a price of $370,000, it isn’t a very expensive lifestyle to start experiencing.